A rare tour to this last corner of Europe that has just opened up to foreign tourism in recent year. We depart from Dubrovnik, Croatia to exotic Montenegro, Macedonia and Albania. 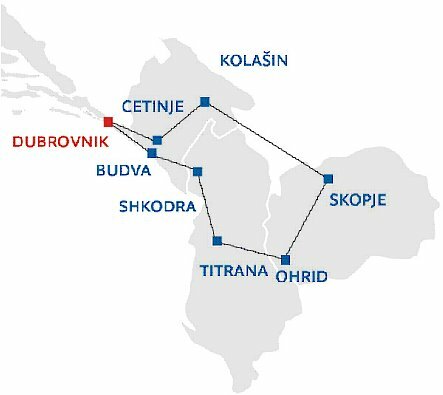 Guaranteed departures from the beautiful Adriatic Coast to Shkodra, capital of the former Illyrian Kingdom surrounded by magnificent mountains. On to Ohrid, a World Heritage city and one of the oldest settlements in Europe nestled on the shores of Lake Ohrid. Admire majestic Alpine scenery at scenic Montenegro before returning to the coast at charming Kotor. Independent arrival at Dubrovnik Airport, meet and greet and transfer to the hotel for dinner and overnight. After breakfast sightseeing tour of Dubrovnik, UNESCO World Heritage site, a lovely ancient town with red roofs circled by protective ramparts. You will visit the Franciscan Monastery with Europe’s third oldest pharmacy, the Rector’s Palace and the Cathedral. Departure for Tirana; we drive inland via Budva, crossing the Albanian border at Shkodra, once the capital of the Illyrian Kingdom (3rd century B.C.). Dinner and overnight in Tirana. After breakfast sightseeing tour of Tirana, the capital of Albania, including the square named after Skender Bey, a national hero of Albania in the 15th century, leader of the rebellion against the oppressing Turkish Empire. See also the Mosque of Ethem Bey and a visit to the National Museum depicting Albanian history from prehistory to the age of National Resistance. Afternoon departure for Ohrid, driving via Elbasan and crossing the Macedonian border at Cafasan. Overnight in Ohrid once an important religious center on the shores of picturesque Lake Ohrid. Full day in the lakeside resort of Ohrid, classified as UNESCO’s World Cultural Heritage site. Through the activity of St. Clement and St. Naum of Ohrid, the first pan-Slavic University in Europe, the famous “Ohrid Literary School” was founded here. Morning sightseeing tour includes the church of St. Sofia (11th century), the most eminent mediaeval monument in Macedonia with magnificent Byzantine fresco paintings and St. Clement Church with its icon of Annunciation. In the afternoon a short drive to visit St. Naum Monastery built on the shores of Ohrid Lake in 900 A.D. and dedicated to the Slavic missionary and educator St. Naum of Ohrid. Return to hotel and overnight. Morning departure for Skopje a city of troubled history which is also the birthplace of Mother Teresa. Sightseeing tour of Skopje, including the Kale Fortress, the Church of the Holy Savior with its icons, one of the finest samples of traditional walnut wood carving, Old Bazaar and Stone Bridge. We drive to the slopes of the Vodno Mountain where we visit the moving little Monastery of St Panteleimon with its 12th century iconostasis and frescoes ranking among the highest achievements of Byzantine art of the period and are considered prelude to Renaissance art by historians. Dinner and overnight in Skopje. Morning departure for Kolašin, driving via Peć and Berane and along the impressive Morača River Canyon. Afternoon arrival at Kolašin, spreading on the left bank of the river Tara, situated at the altitude of 954 meters. The whole area is surrounded by the thick pine forest of the Bjelasica Mountain and is a popular skiing and air spa resort. Dinner and overnight in Kolašin, located high in the mountains on a plateau and a popular winter and summer resort destination with its temperate climate. Morning departure for Cetinje, Montenegro’s historic capital where we visit King Nikola Museum, once the residence of the Montenegrin King Nikola I Petrović, King of Montenegro, a forward thinking ruler. Continuation to Budva and Kotor, classified as UNESCO’s World Cultural Heritage, a coastal town in Montenegro, famous for its spectacular fjord-like setting and former fortifications. We will visit its Romanesque Cathedral dedicated to St. Triphon, the city’s patron saint. We continue to Dubrovnik driving along the picturesque Bay of Kotor. Dinner and overnight in Dubrovnik. Daily breakfast and dinner, half board basis.